You cannot have a party without dip. 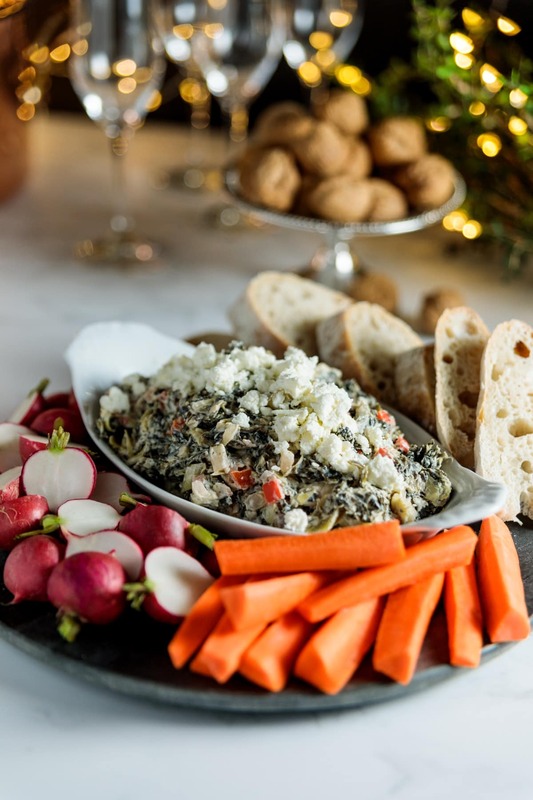 Especially at the holidays, dips and appetizers are my go-to for entertaining. I’m not reinventing the wheel here, more like making it more efficient. Spinach artichoke dip is usually a holiday staple. Rich in mayonnaise and sour cream, it’s delicious, but always used to give me a gross feeling. While the holidays are a time to indulge, I decided to lighten up the dip and give it even more flavor. No one will feel like they’re missing anything when you serve this updated version. Drain thawed spinach and squeeze. Dry set aside with drained and chopped artichoke hearts. Prepare onion, garlic, pepper and mushrooms. Add oil to a large skillet over medium-high heat. Once oil is heated, add onion, salt and pepper and sauté until translucent, 3-5 minutes. Add garlic and red pepper and mushrooms. Continue to sauté until mushrooms have released and cooked off their liquid, 5 minutes. Add lemon juice and Worcestershire sauce. Cook about one minute. Add prepared spinach and artichokes and stir to break up any large pieces. Taste and adjust for seasoning. Add yogurt and mayonnaise and stir until incorporated. At this point, the dip can be cooled and chilled for up to one week or served immediately. Served warm or cold, this is delicious. I garnished with feta cheese and served with pieces of bread, crackers and a selection of vegetables. Any way you choose, this will be a hit!